Amphibious car – About 15,000 built. The Schwimmwagen was a sub-product of the legendary Volkswagen beetle conversion into mass production for the Wehrmacht, under the name “Kübelwagen“, literally, “bucket-car”. A new model was studied by Erwin Komenda, car body designer of Ferdinand Porsche, in 1940, to provide an amphibious car. It was a mix of the VW type 86 four-wheel drive model, mixed with elements of the VW type 87 command-car, using the air-cooled “flat-four” boxer and a transmission with four speeds manual, two tranfer case, and a 4WD capability only on the first speed and reverse. The first body designed was based on the usual VW wheelbase, 240 mm (7,9 ft). This prototype initiated the type 128 series. The type 128 was quickly put on production despite showing some flaws that became obvious in operational theaters of war like the eastern front. The first limitation was its construction in custom welded bodytubes which was perfect because of its lightness in road condition, but unsuitable in rough rides, because of its lack of torsion rigidity. They were many hull ruptures at the front cross members and wheel wells. One solution was to cut 40 centimeters, making a new chassis with a wheelbase of two meters only. This, with a new reinforced hull, gave birth to the prototype of the type 166. The Type 128 was briefly seen, as a pre-production series of less than a hundred cars. With a brand new hull, the type 166 proved far more reliable and was also simplified for mass production. 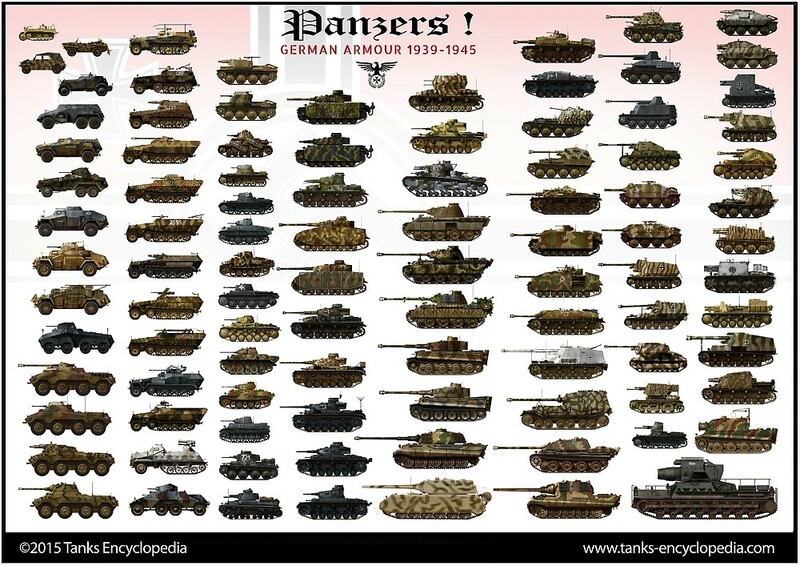 From 1941 to 1944, no less than 15 600 were built, from which 14276 came from Fallersleben (Volkswagen factory) and only 1308 by Porsche at Stuttgart and the bodies at Ambi budd in Berlin. Porsche models differed only by a few details. These cars were characterized by a single speed FWD transmission (sometimes in reverse), front and rear axles ZD differentials, and portal gear rear hubs. A single screw propeller mounted in an amovible gear was easily put in place for swimming, directly tied to the transmission. That means only forward motion was possible. For maneuvers, simple paddle were used, or the normal reverse speed was activated, and the wheel motion could itself slowly move back the car. All these cars were equipped with a removable hood, spare parts and a spare wheel, all on the front, and additional shovel, pickaxe, and paddles locked on the hull sides. There were no doors for rigidity, two front seats and a rear bank. The first of these vehicles equipped SS units on the eastern front and they proved valuable in marshy grounds like in the Pripet, many served also in Wehrmacht units in North Africa and Tunisia, Sicilia, and Europe. They were seen, like the Kübelwagens, in nearly all theaters of war. It was light and reliable and served for scouting, transport, dispatching, command cars, and regular officer cars on the frontline. They were unarmed but proved versatile, sturdy and reliable. Soldiers sometimes nicknamed it “the Frosche” (“frog”). The schwimmwagen remains the most heavily produced amhibious car in history. Its VW mechanical basis made it popular after war, and 166 survived to this day in museums, private collections, and often in running conditions. 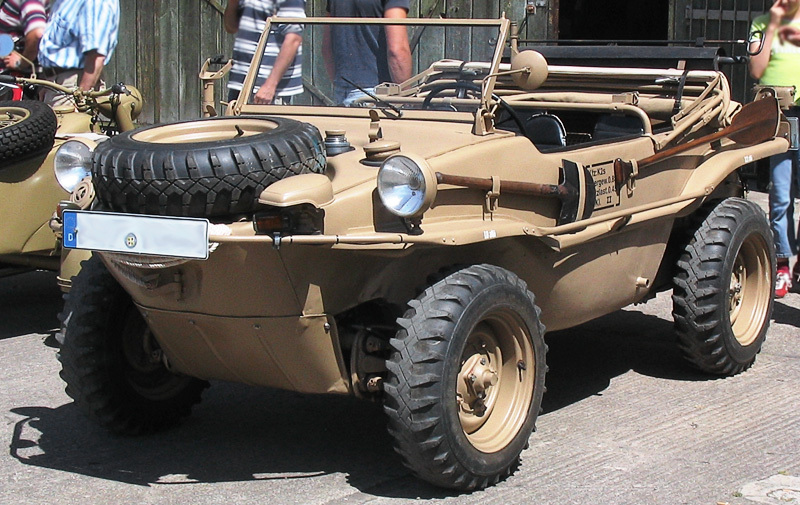 Certainly less known, there was another amphibious scout car in service with the Wehrmacht: The Trippelwagen was built at the Bugatti factory in Molsheim (Alsace) between 1940 and 1944. The vehicle was designed by Hanns Trippel on the basis of a prewar forest civilian work car, amphibious, used also for hunting, fishing, etc. Called SG6, it was propelled by an Opel 6 cylinder gasoline engine capable of 80 kph, had a removable propeller, and its military variant was built to a rate of just 20 vehicles monthly (objective, so about 800-900 total) at Trippelwerke. So it’s quite rare today and an estimated 9 are still in existence, including one at Saumur – Musée des Blindés. Molsheim also produced dozens of Torpedoes for the Kriegsmarine and the Luftwaffe, motorized sleds for the Russian front, flying bombs, and even a light tank prototype (currently researching infos). Exhaustive resource about the vehicle. Total weight, battle ready : 910 Kgs. An Afrika Korps Schwimmwagen, Egypt, june 1942. An eastern front schwimmwagen, Pripet marshes (Russia), august 1941. A Wehrmacht Schwimmwagen in Normandy, june 1944, with the most current camouflage, with dark green and dark brown vermicels on a beige-brown basis.